The last big crisis was “fixed” by a combination of lower interest rates globally and massive buying of commodities by China. But with interest rates still at cyclical lows in a big part of the world (and nearly $10 trillion of bonds sporting negative yields), central banks have limited ammo. China has acted as part of the life support system for the global economy during the past two decades. The other part being comprised of central banks. When the Tech Bubble burst back in 2000, China began printing and borrowing an incredible amount of money to create demand for fixed assets. After the Great Recession struck in 2008, Beijing again reacted with a massive government stimulus package that helped further inflate its real estate bubble and placed a pervasive bid under global markets. It was much the same in the wake of the global slowdown and earnings recession in the U.S. in 2016. In fact, China has been a humongous tailwind for growth since 2000; taking on about $38 trillion in new debt, which amounted to an incredible 150-percentage point increase in its debt to GDP ratio. Because of this untenable debt load, China recently began a much-needed policy of deleveraging, leaving many to speculate how long the global economy can sustain itself without its main growth engine. After all, the Red Nation had been responsible for roughly a third of global growth since 2008. However, and regrettably, China’s flirtation with austerity did not last very long. Authorities have now begun to reset priorities away from reigning in the nation’s $40 trillion worth of debt and are instead seeking to prop up the economy with yet more debt. Some of the debt ratios in China not only exceed that of the U.S. but are also estimated to be twice as high as that of the average emerging market economy. Total debt has more than quadrupled since 2007. Total debt including household, corporate and government increased from 160% of GDP in 2008 to over 304% of GDP in 2018, according to the Institute of International Finance. And all this begs the question: With its massive debt load, does China have the gas left to fuel the global economy, or has Wall Street misplaced its faith in an ersatz economic savior and a resolution to the trade war? For the past three decades, China has been the global growth darling of the world and Wall Street. The communist nation has averaged GDP growth of 9.9% from 1979 to 2010, according to the World Bank. Under its unique combination of communism and capitalism, China’s growth seemingly defied the laws of economics and the business cycle. But a cursory look beneath the surface exposes China’s economic miracle was continuously levitated by a dangerous mountain of debt. While the central government in China holds little debt and enjoys healthy foreign currency reserves, regional government debt, household debt, and corporate debt have exploded. Regional governments in China provide schools, hospitals, and transportation services. However, they have almost no power to raise taxes and receive very little of the taxes levied in their territory. These localities balance their budget by issuing Local Government Financial Vehicles (LGFV). This type of debt is extremely opaque, making it difficult to accurately calculate the actual level of indebtedness, but it ranges between $5 trillion to $7 trillion, according to CHEN, Z. China’s Dangerous Debt: Foreign Affairs. State Owned Enterprises or SOEs accounted for more than half of total corporate debt, or 72% of GDP in 2017 according to the International Monetary Fund (IMF). Most of these enterprises are Zombie corporations meaning they have an unsustainable business model. They exist mainly to employ people and must constantly take on new debt to pay off interest on existing debt. This type of state-directed debt is nonproductive in nature and is a primary contributor to the plunge in labor productivity. The Private Sector Corporate debt consists of bank loans, bond offerings, and shadow banking activities. These debt-laden companies are even more vulnerable to a drop in asset-values and/or a rise in borrowing costs . Slowing growth and tighter regulations have recently triggered many bankruptcies in this space. Finally, we have Chinese household debt, which has been dramatically outpacing household income for the past decade. But debt is not the only overhang on the Chinese economy. China has a shrinking labor force and a population that is rapidly aging. In 2010, 13% of the population was 60 years old or older; but by 2030 that figure skyrockets to 25%. According to Statista, the labor force in China is shrinking by 0.2% between 2016-2026 and then it drops further from there. All these factors prove that China’s recent economic problems have little to do with a trade war. The Shanghai Composite Index peaked two years before the first direct tariffs on China’s exports were put into effect. In the vanguard for this global re-leveraging process was, and is, China. 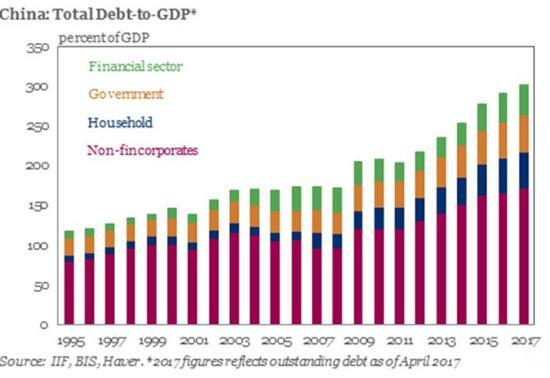 According to S&P Global Ratings, China’s household debt increased by 716%, Non-financial corporate debt jumped by 400%, and total government debt climbed by 416%; all since 2008. And now that immense pile of debt dung is exploding, and it just can’t be easily remedied by yet another stimulus package from Beijing. Proof of China’s debt-disabled condition can be found in the current data. Mobile phone shipments in China totaled 14.51 million in February, a nearly 20% plunge year-on-year, according to data recently released by the China Academy of Information and Communications Technology. In addition, China Auto sales plummeted 14% year over year in February. But last month was no aberration. Car sales were down for the 8th month in a row and have crashed by 16% in January and 13% in December. In addition, China’s Industrial Production in the first two months of this year fell to a 17-year low. Similar to Japan in late-1980s, China’s economic growth once appeared to be unstoppable. This mistakenly led most on Wall Street to believe that the communist nation would eventually leave the U.S. economy far behind in the dust. However, students of history know that Japan’s growth phenomenon came to a sudden halt in 1989; at the same time of its epoch market crash. Likewise, China’s economy and equity market peaked in 2015 and the Shanghai Index has fallen by 43% from that point. By accumulating debt at such an aggressive rate, China is following in the same footsteps as its historical enemy to the east. All indications are that it will soon experience a similar fate, as the government’s debt scam implodes. The joke here is that equity markets are banking on yet another global growth slingshot to occur very soon. But as to why the supposedly bastion of capitalism that exists on Wall Street has misplaced its faith in a communist nation’s ability to magically produce a targeted rate of growth on demand should be a mystery. Sadly, the truth can be found in that carnival barkers are always is search of a good story to tell; no matter how much fiction is involved. Investors would be wise to use extreme caution given the fact that this global earnings and growth recession is occurring while equities are at all-time high valuations and at the same time debt levels are off the charts. Especially when central banks have either very little, or in most cases, zero room left to lower the cost of debt and boost economic growth. A dovish Federal Reserve has given emerging markets a lift this year. Now investors are starting to realize the Fed’s change of heart may not be all good news. Until recently, stocks, bonds and currencies in emerging markets had all risen this year. 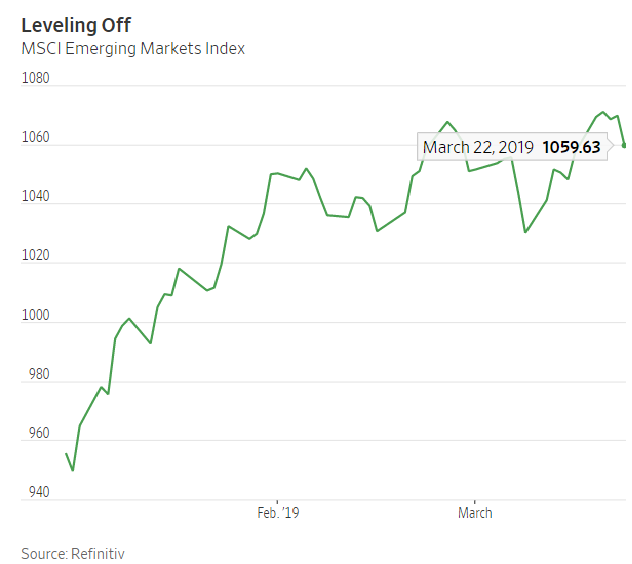 The MSCI Emerging Markets Index is still up 10%, partially reversing last year’s 17% loss. The Fed helped kick investors into risk-taking mode when it signaled in January that it was done raising interest rates. That helped spur a resurgence of so-called carry trades—borrowing in dollars to earn higher returns in emerging-market assets—leading to stronger EM currencies, especially high-yielding ones such as the Indian rupee and the Mexican peso. The Fed’s announcement last Wednesday that there would likely be no more rate increases this year fueled further gains in EM assets. That is, until Friday, when investors finally woke up to the fact that a dovish Fed may mean the U.S. economy is weaker than expected. The 10-year Treasury yield dropped below that of the three-month on Friday for the first time since 2007. Such a yield-curve inversion preceded each of the past seven U.S. recessions. EM assets have since taken a hit: The Mexican peso fell 1.6% on Friday, while Asian stocks plunged on Monday. To be sure, a yield-curve inversion for one day isn’t a guaranteed predictor of bad things to come. It does, though, add to a worrying pileup of bad news for the global economy that investors have been all too ready to ignore this year. Many have also seemed to assume that another Beijing stimulus would stoke the Chinese economy back to health. But significant monetary policy easing there has failed to translate into higher lending to the private sector: Beijing may now have to enact a U-turn on its shadow-banking crackdown. Meanwhile, the uncertain outcome of U.S.-China trade talks still looms. Expectations of lower U.S. rates juiced up emerging markets. As investors recalibrate what those lower rates really mean, reasons are mounting to believe the best may be over for EM this year.